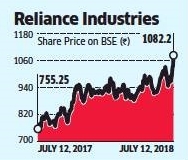 Reliance Industries shares hit an all-time high, breaching the $100-billion mark for market capitalisation, a feat achieved by the company only once before in 2007. RIL joins Tata Consultancy Services in the $100-billion market cap club, leading the leader-board for India’s most-valued companies. At the company’s 41st annual general meeting on July 5, Chairman Mukesh Ambani said that RIL aimed to more than double its current size by 2025, as its customer centric business expands to match the traditional revenue stream. On Thursday, shares of RIL rose 6% to touch an all-time high of ₹1,098 on the Bombay Stock Exchange. The shares closed at ₹1,082.20, making its market capitalisation stand close to ₹7 lakh crore ($103 billion). Prior to this, RIL broke into the $100-billion club once, in October 2007.